It is time to rethink the role of the electric boat. We all know that electric power is quiet, economical to operate and environmentally friendly both locally and globally. Although ideal for short excursions and entertaining friends, longer cruises are now possible with the right design and power system. Efficient hulls with weight capacity for batteries and new motor technologies provide range and capabilities beyond those of traditional electric boats. Add solar panels for off the grid battery charging and a cabin for more time on the water and you have a new paradigm for cruising fun. Hybrid propulsion systems are now available for larger cruising boats with synergistic total system benefits in terms of energy utilization. 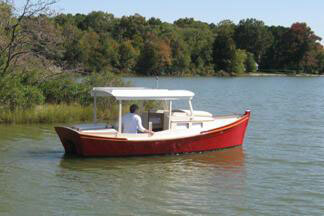 Economical construction makes these boats available at a fraction of the expensive electric production boats. Do you want to save money, make a difference environmentally and have more relaxing fun on the water? ELECTRIC SKIFF 15 is designed specifically to be powered efficiently by an electric outboard or trolling motor and is an easy boat to build for entry into the fun of electric boating. 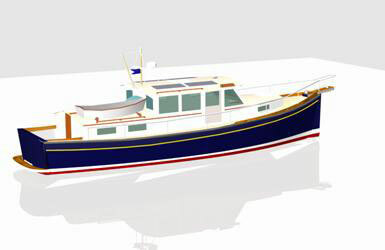 REDWING 18 has a new SOLAR Electric option. It is an economically built boat with an efficient hull form and is ideally suited for the latest technology in electric outboard propulsion. The new motor technology will power the REDWING 18 up to 5 knots or more, with 3.5 to 4 knots more economical creek crawling speed. Weight capacity for two banks of batteries provide over 24 hours of economical cruising. Combined with an easily trailering capability, and you have unlimited cruising range in areas like the Chesapeake Bay, intracoastal waterways and canals. Add a few solar panels to charge a second bank of batteries while underway and the possibilities are even better. The cabin is suitable for camp cruising and private facilities for mixed crews and extended outings, a feature not available on any other electric boat her size currently on the market. REDWING 21 HT - Redwing 21 hard top solar charging version is a new addition to the redwing fleet. Solar panels extend range while cruising and provide off the grid charging capability. Power is the new Torqueedo Cruise 4.0 or modified outboard with E-tec pancake motor if you prefer a DIY power version. The Redwing 21 has ample weight capacity for two banks of 6 volt or 12 volt batteries. REDWING HYBRID 40 - Hybrid with new powering option made possible by the latest technology in electric power. The heart of the propulsion package is a new hybrid diesel with electric motor in the power train. This technology produces an integrated electric system that is more efficient, costs less and saves operating costs than individual propulsion and separate generators common on yachts today. The Skipper will have infinite speed control at their fingertips for docking and locking. Under electric power, there is no need to clutch in and out to maintain control with the engine running at idle burning fuel even if not going anywhere. As with all new technologies, many of the advantages haven’t even been fully imagined. Solar panels on the pilothouse top complete the energy efficient approach. While current solar panels aren’t efficient for primary propulsion for boats of this size and the sun only offers a relatively small window of peak charging hours, solar recharge will supplement overall power usage. AURORA 40 - We have been working on a hybrid version of the AURORA 40 as an electric yacht. The same new integrated powering system mentioned above for the REDWING 40 Hybrid can be used effectively on the AURORA 40. This is pure class in a very quiet economical cruising package. Electric power allows full sound and vibration isolation for extremely quiet operation. She has ample space for solar panels on the house top without looking awkward as with many new solar powered boats. We are also involved in the application of new fuel cell technology in marine applications. Range and efficiency are greatly improved with the new exciting technology. Chesapeake Marine Design will be help you with specific requirements in electric boat and electric system design. We have hull kits for each of these designs. Whether you build yourself or have a boat built professionally; you will save considerable construction time. Go Green, Make A Difference and Have Fun Too! Please contact us at karl@cmdboats.com for more information on electric boats and download our informative paper. PDIY Solar Power for Electric Boats - How To Notes and Resources $15 [pdf] download.